HITACHI INTRODUCES ECOHEART NEW ERA PERMANENT MAGNET MOTORS AND DRIVES : News Releases : Hitachi America, Ltd.
TARRYTOWN, NY, January 10, 2006 -- Hitachi America, Ltd., Power and Industrial Division, today announced the new ECOHEART family of high efficiency permanent magnet motors and drives. ECOHEART represents a new era in drives technology. 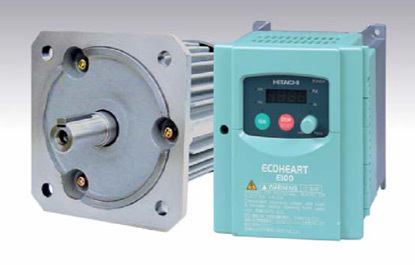 ECOHEART is targeted to OEMs, allowing them to create their own customized drive system. Compared with conventional standard induction motors, ECOHEART permanent magnet technology achieves 10% higher efficiency because the internal power loss is reduced by 50%. Also, the volume of the motor is reduced by 50% and the weight by 35% due to high performance magnets and a new method of winding the stator. With the sinusoidal motor current wave form developed, instead of trapezoidal wave form which typical permanent magnet motors employ, ECOHEART achieves low torque ripple, low vibration and acoustic noise and much reduced harmonics. ECOHEART Drives have no standard form factor and can be OEM unique. In the current release, ECOHEART performance is optimized for Water Pump Applications and will be expanded in the future to other application such as Fans, Compressors, Conveyors, where more and more energy savings and downsizing are critical. *Ecoheart is a brand name of Hitachi, Ltd.